Although there are some miracle prescription drugs on the market which can help curtail the crippling effects of Rheumatoid Arthritis (RA), there is still no cure for this chronic disease. No one knows exactly why some people end up permanently crippled while others can live somewhat normal lives with few minor adjustments. No matter the severity of the RA, we must continue balancing our lives to the best of our abilities. This means we must work, raise our kids, nurture romantic relationships, maintain friendships, deal with finances and go to school… Yes, all of the easy “normal people things” must still be managed while undergoing those ever annoying surprise RA flare-ups and constant pain. Diet and exercise, along with your prescription medications can be instrumental in controlling the effects of RA. There is strong evidence suggesting that omega 3-fatty acids can act as an anti-inflammatory agent thus helping to reduce pain and stiffness. That being said, fish should be consumed regularly by those with RA. Nutritionists recommend 2-3 meals of fatty fish per week. If you absolutely hate the taste of fish, try supplementing the dish for fish oil capsules instead. Rheumies should get a daily dose of Folic Acid, especially when taking methotrexate. Folic Acid helps your body manufacture red blood cells. Deficiency can lead to anemia, weight loss, loss of appetite and diarrhea. Natural sources of Folic Acid come from green leafy vegetables, as well as some fortified grains like cereal. Vitamin C is an anti-oxidant vitamin that can help prevent cartilage break-down. Vitamin C deficiency is detrimental to immune function. Since RA is an autoimmune, persons with RA should get regular doses of Vitamin C.
All B vitamins are water soluble meaning the body doesn’t store them. These vitamins are important because they help the body convert food into fuel. Vitamin B6 is especially important for nervous system health as it helps regulate brain development and function. Dietary sources of vitamin B6 come from poultry (chicken and turkey), seafood (shrimp, salmon and tuna) as well as beans, spinach, carrots, brown rice, wheat germ and whole-grain flower. 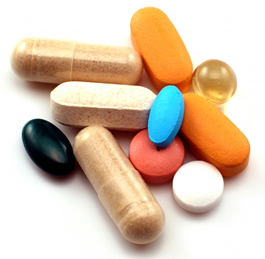 In supplement form, 50 mg can be taken daily. If unable to spend 15 minutes per day in the sun, RA patients are strongly urged to integrate vitamin D supplements into their treatment plan. Vitamin D is such a beneficial vitamin to rheumies because it assists the body in absorbing calcium thus maintaining stronger, healthier bones. Vitamin E is recommended to rheumies as it can clean free radicals while also fighting joint inflammation. While this vitamin doesn’t by any means prevent RA or all flare-ups, it has been known to give relief to some rheumies. If you want to avoid supplements and take the more natural route, eat plenty of asparagus, avocado, eggs, milk, nuts, spinach and whole grains to get your healthy doss of vitamin E.
Since taking all the supplements above might seem a little overwhelming at times, especially given the large number of pills you already ingest daily for RA, I recommend considering one daily multivitamin vitamin along with a healthy diet. Eating a combination of the foods mentioned above can help raise our vitamin intake to suggested rheumy levels. After all, we are what we eat. Has anyone tried treating their RA with any of the “special” joint juices on the market? Tell me about your experience. Was it glam or scam?